I grew up in the 80s - boxed mac and cheese would make the rounds on our dinner plate. We seemed to get the traditional kind - the small elbow shaped noodles with the electric orange sauce packet. I did not like it! I liked the one with shells and the super creamy sauce. Over the last few months vegan mac & cheeze has taken over the selves. In the last few weeks Matt and I have dabbled in the boxes we picked up at Whole Foods. So Delicious: Most like the blue box I remember from childhood. Kinda cheesey, kinda chemically, a bit dry. You add your own spread and non-dairy milk with this one. 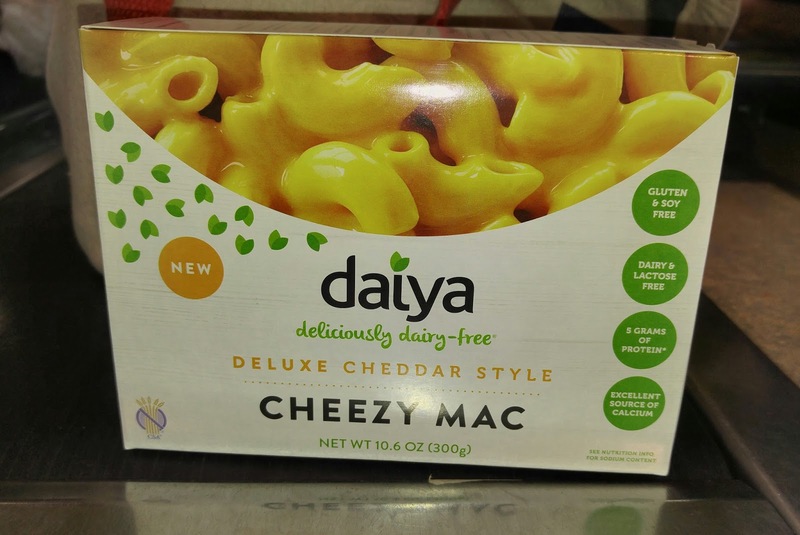 Daiya: Winner! 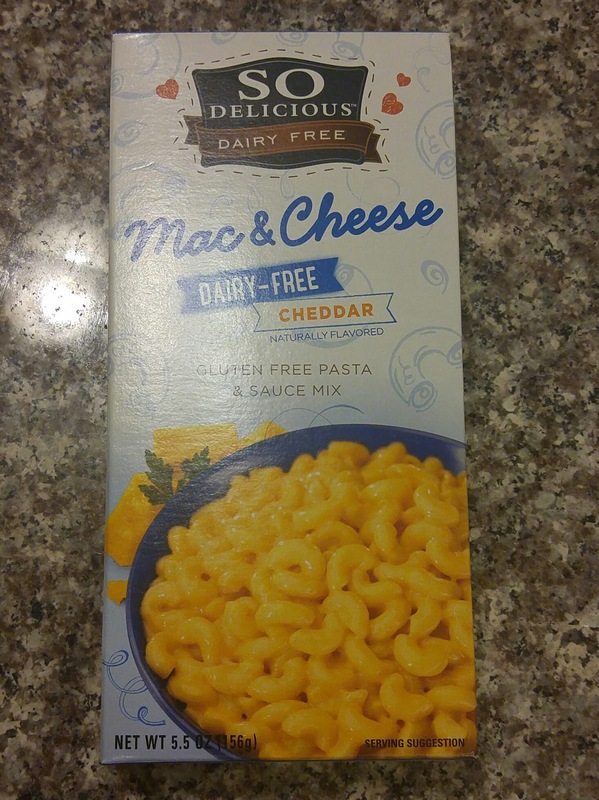 This is super creamy, everything comes in the box and has a great taste. It had the creaminess of the shells I remember as a kid.I believe this one was the most pricey on the shelf but it is the one I would buy again! 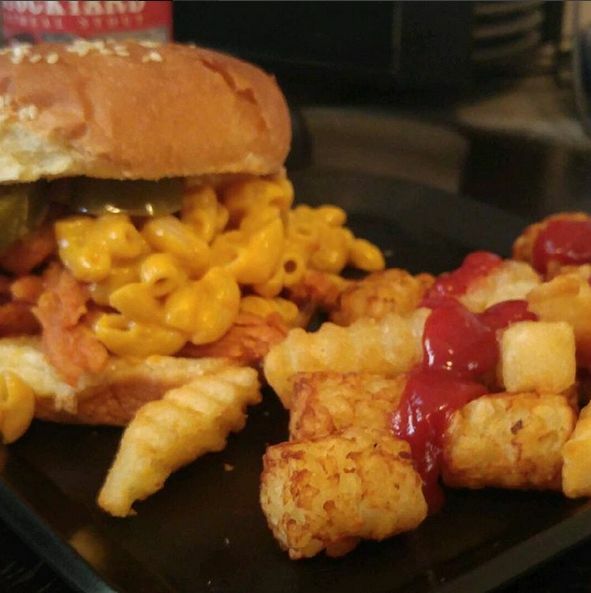 This is how I used the Daiya mac & cheeze: pan fried bbq Soy Curls, jalapenos and the mac & cheeze between a whole wheat bun. Fries and tots on the side because I only had a handful of each in the freezer. This was super yummy and something I will be making again for sure! It is not hard to make your own stove top mac & cheeze now that vegan melting cheeze is on the market. Buying it in box form is fun and serves for nostalgic purposes but at the end of the day I like the stove top kind. I like mine topped with hot sauce and Tajin. We didn't eat mac&cheese at home but it was the go to at friends houses for sure. M&C on it's own seems a little boring to me but your addition of soycurls has me digging the idea. I would love to be able to get boxed M&C over here, mainly for lazy days when I don't wanna make my own.